I looked for duplicates but couldn't find any. This question might be related. The last suggested edit review by that user was for an answer they themselves wrote. Having exhausted one's review quota for the day of course does not remove the possibility to review edit suggestions for one's own posts. (I don't know for sure whether reviews for own posts count to the quota before it is exhausted, I believe they do.) 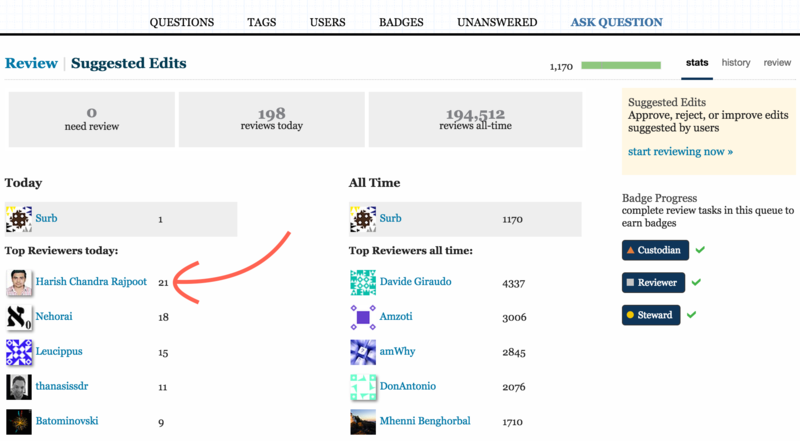 In that way, also non-moderators can make more than 20 reviews of suggested edits per day. Not the answer you're looking for? Browse other questions tagged support review rate-limiting . Have the limits on number of questions per month/day been increased (or cancelled)? How do you migrate questions from Math.se to Meta? How can the effect of a proposed edit be viewed? Is there a way to block pings/notifications of a specific user? Does the “viewed” counter also count the poster's view?